Born at Cleveland, Ohio, December 24, 1878, he joined the Army in June 1898. He was a Captain in the Signal Corps when Brigadier General James Allen on August 1, 1907 established an Aeronautical Bureau by office memorandum and put him in charge of it, assisted by two enlisted men. 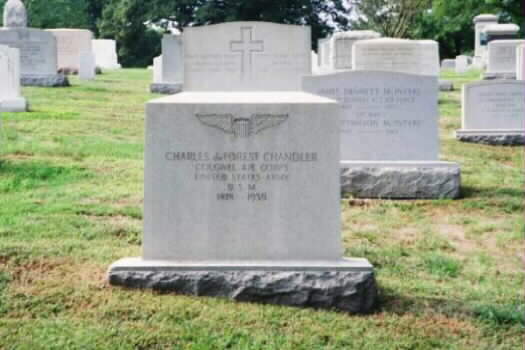 He was Commanding Officer of the Aviation School at College Park, Maryland, when Henry "Hap" Arnold, Tommy Milling and many other early-day aviation fledglings took their training. During World War I, he served in France as Chief of the Balloon Section of the Air Service. On December 23, 1907, the Aeronautical Division of the Signal Office, Captain Charles deForest Chandler, Office in Charge, advertised for a heavier-than-air flying machine. The machine was to be "entirely supported by the dynamic reaction of the atmosphere and having no gas bag." It was to be constructed so that it could be taken apart and moved about in a standard Army horse-drawn wagon. It was to be simple enough so that "an intelligent man" could become "proficient in its use within a reasonable period of time" and contract price was to include the training of two pilots. Technically, the machine was going to have to carry two men 125 miles without landing, and be capable of 40 miles per hour in still air. Part of its acceptance test was to be a flight of "at least one hour without touching the ground" and during which "it must be steered in all directions without difficulty and at all times under perfect control and equilibrium." On August 18, 1908, the Baldwin non-rigid dirigible, now more accurately known as an air-ship, successfully complete its trials. It looked like a plump cigar, with a gasoline driven propellor hanging beneath it. Chandler immediately tested the three young officers, Lieutenants Frank P. Lahm, Benjamin D. Foulois and Thomas E. Selfridge, who had volunteered to serve under him, by turning them over to Baldwin for pilot training. Two days after the air ship was accepted by Chandler and General James Allen, the brothers Wright showed up at Fort Myer, Virginia, across the Potomac River from Washington, with their airplane. On September 3, 1908, the Wright Brothers flew their airplane before an Army audience which included the the new balloon pilots and a delegation of officers from a Board of Ordnance and Fortifications. The plane was a modification of the Wright Model 1905. The engine and prop were behind the pilot and passenger, and in front of them was what appeared to be another tail. The first flight lasted 71 seconds. Other flights followed, with Orville Wright at the controls, and the plane remained aloft for 1 hour and 35 seconds, two minutes and fifteen seconds longer than the contract called for. The next step was the instruction of Army officers as pilots. Before this activity began, Orville Wright took Selfridge up on a familiarization flight. Selfridge, generally conceded to be the most knowledgeable of the pilots, was already technically a pilot. On May 19, 1908, he had flown solo the "White Wing," the airplane designed and built by the inventor of the telephone, Alexander Graham Bell. Flying 150 feet over Fort Myer, Wright put the plane into a steep turn. The wing flexed and the propellor snagged on a wing-brace wire. The prop blade snapped off and the plane went out of control and crashed. Selfridge died that afternoon, the first man killed by a heavier-than-air flying machine. Orville Wright was hospitalized for several weeks with injuries, but Wilbur Wright immediately went to work repairing the aircraft's damage, and shifting the wing braces to prevent another accident. Chandler retired from the Army in October 1920 with the rank of Colonel, but continued his interest in ballooning as a civilian. He died in Washington, D.C. on May 18, 1939 and was buried in Section 3 of Arlington National Cemetery.